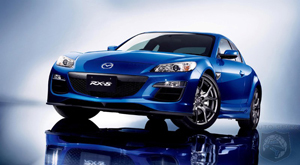 MX5 Motors are one of the leading Mazda MX5 Specialists in the UK and also specialize in RX8's and RX7's. MX5 Motors now specialize in all Mazda's as well as Mazda MX5's and Mazda Rotary powered cars, we cater for all the needs of every model of Mazda, including Servicing, MOT's, Mazda parts, Mazda RX8 /7 engine rebuilds. 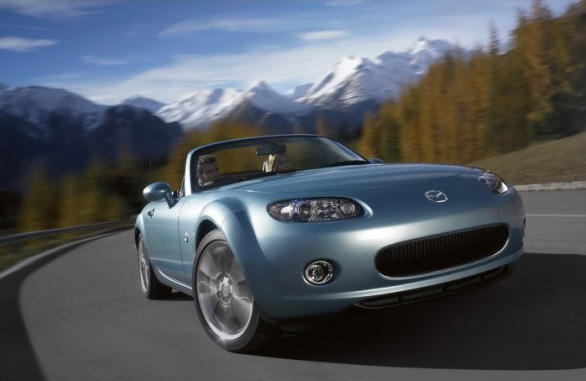 At MX5 Motors you get a specialist service for local prices. Call us on 01302 726763 or e-mail steve@mx5motors.com. Hangthwaite Road, Carcroft, Doncaster, South Yorkshire, DN6 7BD. Mazda Restoration and body shop repair. 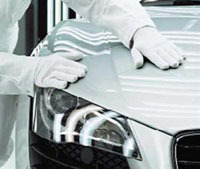 Our body shop team have over 50 years combined experience in repairing and restoring Mazda's, so you have piece of mind that your car will be repaired by our fully qualified body-shop technicians to the highest of standards. We specialize in Mazda accident repairs, and offer quality and reliable services you can count on. Whether you need vehicle repairs following accident or vandalism or refurbishment prior to returning a vehicle off- lease or contract hire, we also do full vehicle restorations from refreshing a car ready for sale to full classic car restorations, we have what you need at prices you can afford!No job it too big or too small, whether its a small scrape to a full restoration just give us a call on 0845 2300 856 for further details. Whether your car is just looking a little tired or suffering from rust, we can repair the area affected in a matter of days. We always remove all rust and replace the area with new metal and treat the area inside and out to protect it from further decay. 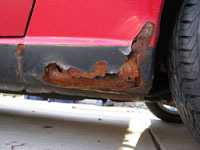 From small spots of rust to full wheel arch and sill replacements, from underbody floor repairs to structural rust repair, We approach all repairs with in the same manner, remove the rust, treat the area, replace the panel with new metal then treat the area again, then we finish the area with paint or under floor stone guard. With MX5 Motors you can rely on our Professional Body Shop Team to repair your car to its former glory, just give us a call on 0845 2300 856 for a no obligation Quote. Mazda Specialist Servicing And Repair. Protect your car from the salt and winter elements with a Full underbody wax oil for just £89, one we have applied a wax oil treatment to the under floor of your car we will top it up free of charge each year during a service free of charge, so your car stays solid and rust free, Call us on 01302 726763 for more information. Second hand RX8 and MX5 Parts now available. We now have a number of Mazda RX8's and MX5's we are breaking, so if you need a second hand part for your Mazda give us a call on 01302 726763. Most parts are available including all suspension components, interiors, wheels, headlight leveling sensors, all body panels including doors. All parts are checked before dispatch so your guaranteed to receive a quality item. Interim checkup for just £19.99. With the colder weather on its way, have piece of mind that your car is in best possible condition for some top down driving. We also check the battery and alternator for optimum performance. All this for just £19.99, if you would like to book your Mazda in please feel free to contact us on 01302 726763 or e-mail Steve@MX5motors.com. MX5 Motors are pleased to announce that we can now register your Mazda service with the Mazda Digital Service Register, Therefore keeping digital service records up to date. If your vehicle was built after 31st December 1997, you can choose to record your vehicle's future service history using the DSR system. Just ask to add your car to the system when you have your next service. We are please to introduce a full health check for all Mazda Rotary Powered cars. The health check comprises of a full Annual service as well as a full mechanical inspection and advise condition on brakes, suspension, Steering, Differential and gearbox oil, engine oil, underbody condition, Tires, bushings, engine mounting, Spark plugs, Ignition leads, general overall condition check, and a Full Compression test with printed results. All the above with the options of a Full underbody wax oil and any reliability mods. Please phone for prices on reliability mods like up rated starter motor, plugs, magna core leads etc. MK1 Vinyl hood with plastic back window only £275 Supplied, fitted and including Vat. MK2 Vinyl hood with heated glass back window £399 Supplied, fitted and including Vat. MK2 Mohair Hood with heated glass back window £508 Supplied, fitted and including Vat. Please call 01302 726763 for any other prices. Mazda Diesel Partial Filter regeneration DPF. We are pleased to announce that we can now reset and regenerate your Mazda DFP filter for just £75, this includes a full regeneration of the DPF filter, all the relevant check to the engine oil levels and dilution, recalibration of injectors and reset service indicators if required, we also check for any engine warning lights at the same time, and all for just £75, if you would like to book your Mazda in please feel free to contact us on 01302 726763 or e-mail Steve@MX5motors.com. MX5 Motors are proud to announce that with our many years of dealing with Mazda's we have acquired a wealth of knowledge in the full range of Mazda's, From the sporty MX5, RX8 and MPS to the Mazda 3, Mazda 6 and all other models, we can now service, repair, modify or restore your car, we deliver a specialist service for local garage prices, you will get a dealer level service but at a fraction of the cost, our workshop is fully equipped and all aimed to be a one stop for all your motoring needs, please don't hesitate to call us on 01302 726763 or e-mail steve@mx5motors.com for any more information. Mazda MX5 full annual service, including health check. The sun has got his hat on so time for some top down fun, why not fire up your MX5, find a country route and have a fantastic day of driving, don't forget we can now offer a full annual service and a free summer health check for just £98, this is a full industry standard service and health check for your MX5, and includes all parts labor and Vat, give us a call on 01302 726763 to book your car in. Injector Flow testing and cleaning by post now available. We can now offer full injector flow rate and pattern testing for increased performance, better fuel economy, improved drive ability, and all via post within 2 days of receipt. Injectors are flow rate and pattern tested before and after ultrasonic cleaning, with printed results for just £55 for 4 injectors, returned by post within two days of receipt. Latest Stock of Mazda MX5's for sale, NOW with 6 months warranty. At MX5 Motors we have customers waiting for the right car to purchase. So if your thinking of selling your MX5, why not give us a ring on 01302 726763. We can buy your MX5 for cash, restor it and give it a new home. Due to popular demand we have opened the Media section so you can see what is happening at MX5 Motors, Including any meets or open days pictures and videos, also any current projects will be posted there as well as on our face book page. Our workshop is equipped with the latest equipment and is designed specifically for the Mazda MX5 and Mazda Rotary cars. A replacement Mazda MX5 Hood for only £266 supplied and fitted. A full MX5 service for only £98 with all service books stamped. Full Wax oil for only £89 to keep the car as good as the day it was made on your New or Used Mazda MX5. Don't forget to add us to your facebook. For all your discount codes and special offers make friends here with MX5 Motors on Facebook. Injector flow rate and pattern testing. RX8 and MX5 key coding. Pre MOT checks with emissions testing. MX5 Motors Address and Location. Doncaster, South Yorkshire DN6 7BD , please contact us on 01302 726763 or by e-mail on steve@mx5motors.com for more info. MX5 Motors are proud to announce that with our many years in dealing with Mazdas we have acquired a wealth of knowledge of the full Mazda range, so therefore we are now welcoming Service, Repairs, Restoration and Modifying to all Models of Mazdas. Just a few typical prices are as follows. At MX5 Motors we can service, Repair and Upgrade your Mazda RX8 to the highest of standards with all service books stamped. We can also update your digital service history at no extra cost and supply you with a full printout.